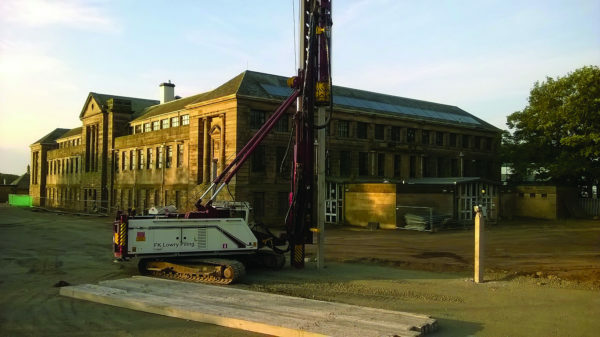 FK Lowry Piling have successfully completed a £100,000 Precast Driven Piling Project for Kier in Troon, Scotland. The project involved the design and installation of 186 No. 250mm x 250mm Square Precast Driven Piles to approximate depths of 12m for a new Schools Academy. Client, Hub South West Scotland appointed Kier Construction to deliver two state-of-the-art secondary schools – one in Troon and one in Ayr – on behalf of South Ayrshire Council. Marr College in Troon will undergo a comprehensive refurbishment, modernisation and expansion programme. The original listed Grade B building will be refurbished and a brand new wing will be built over three storeys, connecting it to the rear of the original building over all floors. A single-storey sports facility will also be built, which will be easily accessible for both pupils and the wider community out of school hours.